With almost all piercings, it is expected to have a bit of swelling at the beginning of the healing process. Our piercers will choose jewelry that accommodates the amount of expected swelling. Like the picture below of the two forward helix piercings, you can see that there is longer posts in them so there is room for the tissue to swell while healing. After a few weeks the swelling will subside and the initial jewelry will then be too long for the rest of the healing period. It is very important to come back to see your piercer to change out your jewelry to something a bit more snug fitting to avoid any damages or irritation to your new piercing. 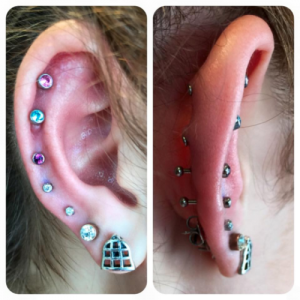 If the piercing is left with long jewelry even after the swelling has subsided, you run the risk of having your new piercing snagged on things like hair or clothing which can lead to many different problems including those seen in the second picture of multiple helix piercings (Second photo and piercings not by Vicious Ink). 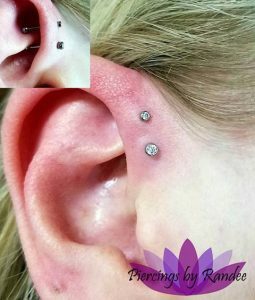 In the second picture you can see two fresh lower helix piercings done with perfect angles and then right above you see two healing piercings with irritation bumps. Those are caused by not downsizing your jewelry soon enough. Those irritation bumps could be caused from snagging the jewelry, or sleeping on the piercings and pushing the angles to shift. These could have been avoided with proper downsizing of the jewelry. When you choose to have a quality piercing done at Vicious Ink, we make sure to use the best jewelry available, and you pay a higher price for that. We want you to have the best piercing possible, so to ensure that, we need to assist you in properly downsizing your body jewelry in your new piercings. We don’t want you to waste your hard earned money on a well done piercing, just because you didn’t properly downsize your jewelry, causing the piercing to become irritated and not looking the best it possibly can. For more information on downsizing your jewelry after the initial piercing, feel free to contact either of our piercers at either one of our locations! 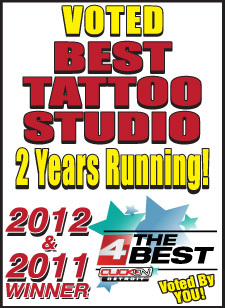 The BEST Tattoo Shop in Detroit!